A cult figure which continues to loom large in the annals of soul singers, Donny Hathaway in his short time on earth, left behind an inspiring legacy of elevating the music into a more spiritual plane. This short bio is to pique the interest in Hathaway, and guide readers to the more extended profile of the man here @ all about jazz in an outstanding article by C.N. Harold entitled: Donny Hathaway; Celebrating the Spirit and the Soul. Hathaway was born in Chicago on October 1, 1945, but spent much of his childhood in St. Louis, where he lived in the Carr Square public housing project with his grandmother, Martha Pitts, who also went by the name Martha Crumwell. Pitts was a professional gospel singer, and Hathaway spent his early childhood time in church, watching her rehearse and perform. Inspired by this environment and the natural development of his talents he was drawn to a life of music. Hathaway soon began singing professionally as Donny Pitts, The Nation's Youngest Gospel Singer. He also played the ukulele on stage, studied the piano, and as a child was fascinated by flamboyant piano virtuoso Liberace. At St. Louis's Vashon High School, he quickly made a name for himself as a piano prodigy. Backed by the support of his teachers, Hathaway earned a fine-arts scholarship to Howard University and entered in 1964. During his time at Howard, he met his future wife, Eulaulah, and recording artist Roberta Flack. Hathaway would leave Howard without his degree after three years of study; he had begun to receive lucrative job offers, in part because of his membership in a group called the Rick Powell Trio. While at Howard, Hathaway achieved early success in the recording industry by working as a producer and arranger for several acts, including Aretha Franklin and the Staple Singers. He also produced artists for Chess and Stax Records, and served as the band director for the Impressions, a group fronted by another Howard classmate, Leroy Hunter. In 1969, Hathaway teamed with a singer named June Conquest and recorded the single I Thank You for Curtis Mayfield's Curtom label and sang backup with the Mayfield Singers. Signed by Atlantic Records in 1969, Hathaway's first single, The Ghetto, Part I, was released in late October and peaked on the R&B charts at No. 23 the following January. The heartbreaking, mournful tale of inner-city misery quickly established Hathaway as a talented singer/songwriter with a deep debt to his gospel roots. More singles followed, along with his first album, “Everything Is Everything,” released in 1970. Hathaway soon collaborated with Roberta Flack, who was embarking upon her own successful recording career. One of their first singles together was You've Got a Friend, written by Carole King and released in 1971; Their third single, Where Is the Love? soared to No. 5 on the charts in 1972 and earned the pair a Grammy Award. 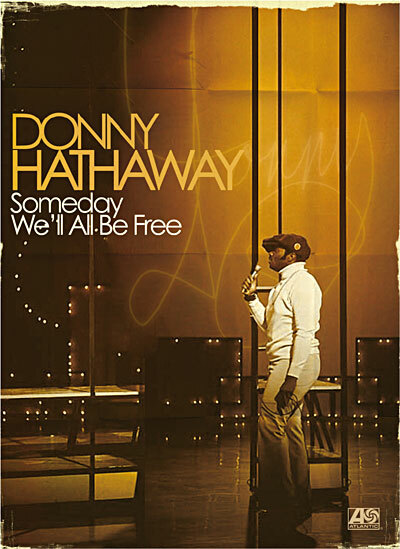 The album on which Where Is the Love? was included, Donny Hathaway Live: Roberta Flack and Donny Hathaway, was also a huge commercial success. Hathaway's familiar voice made its television debut when he was selected to sing the sassy theme song for Norman Lear's television sitcom Maude. Producer Quincy Jones also hired him to score the soundtrack for the 1972 film Come Back Charleston Blue. By this time, Hathaway was married and had two daughters, Eulaulah and Kenya. However, his fame was also accompanied by pain and disappointment. He reportedly suffered from bouts of depression, and was hospitalized on more than one occasion. In addition, his partnership with Roberta Flack disintegrated. Following the release of his album, “Extension of a Man” in 1973, Hathaway faded into relative obscurity. He played small club dates and formed an independent production company. In 1978, Hathaway's fortunes improved. The rift with Flack was mended and the pair returned to the studio to record another song, The Closer I Get to You. It was their biggest hit to date, charting at No. 2, and earned them another Grammy nomination. Hathaway, however, would not live to attend the awards ceremony. On January 13, 1979, Hathaway and his manager, David Franklin, had dinner at Flack's apartment in New York City. Following dinner, the singer returned to his hotel room at the posh Essex House. Later that night, Franklin was notified that Hathaway's body had been discovered below his fifteenth-floor window. The hotel room door was locked from the inside, and there was no sign of foul play. The window's safety glass had been removed and laid on the bed. It appeared that Hathaway had either jumped or fallen to his death. Two other records were released posthumously: “Donny Hathaway in Performance,” in 1980 and “The Donny Hathaway Collection” in 1990. All About Jazz musician pages are maintained by musicians, publicists and trusted members like you. Interested? Tell us why you would like to improve the Donny Hathaway musician page.